Royal Air Force (RAF) Mildenhall is located in Suffolk, England and is the largest USAF presence in the United Kingdom. 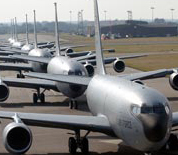 The host unit is the 100th Air Refueling Wing, which is responsible for air refueling operations for US and NATO forces in Europe, using the Boeing KC-135R Stratotanker. Additional units include the 501st Combat SUpport Wing, the 342nd Special Operations Group, the 95th Reconnaissance Squadron and the 488th Intelligence Squadron. This RAF Mildenhall directory features the critical info you’ll need to navigate through the many facilities and recreational opportunities available on base­­.